President George W. Bush is under the gun again south of the border. The President stands accused of trampling civil liberties in his country on his pursuit of every bogeyman in the closet. On Friday, The New York Times broke a story claiming that Bush secretly signed an order authorizing the National Security Agency (NSA) to eavesdrop on Americans who were communicating with individuals overseas to determine if they had terrorist ties. Bush, without confirming or denying the report that he OK'd eavesdropping on U.S. citizens in 2002, defended his actions since September 11, 2001, saying he has done everything "within the law" to protect the American people. The 2nd term for George Bush has been an overwhelming failure. Every poll, spare one (likely conducted in Crawford), indicates the President's job approval, vision for the country and plan for Iraq are all wrong. 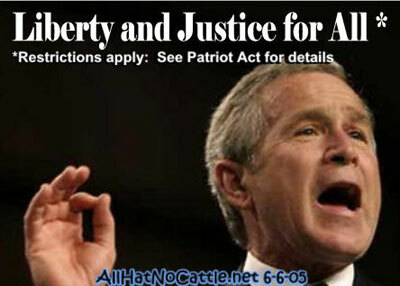 The Senate has compounded the Bush Administration's problems by rejecting efforts to renew expiring provisions of the Patriot Act, dealing a major blow to both Bush and the Republican leadership. # posted by Shaky @ 11:49 p.m.
"Ovewhelming failure" is an understatement. Failure Magazine (online at http://www.failuremag.com ) is all set to name George W. as "Failure of the Year." # posted by Anonymous : 2:14 p.m.